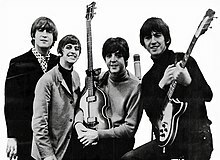 We all have one, so please let me give you my take on the Beatles and how they affected my life. I was fifteen years of age and living in West Orange, where I grew up. My friends and I were the kids from “The Valley”, the lower section of town. Not lower in class, but geographically speaking , we really lived in a valley. The music we loved and listen to at the time was made up of doo-wop, left over from the 1950’s., R&B, and the new sound of Motown. The groups we listened to were the Temptations, the Four Seasons, Beach Boys and our favorite group harmony ensembles such as the Moonglows, the Dells, and the Duprees from New Jersey. We listened to and sang these songs under street lights and under the local railroad tracks at the ”tunnel”. It was, up until that time, our roots, our heritage, and we loved it. But then a new sound came along. We, at first, did not like it. There was no true harmonies, they sounded off-key, and the songs sounded “goofy”. They called themselves “the Beatles”, even their name was goofy. We resented them. Who were these English kids? Who did they think they were and why are girls screaming over them? My friend, Carl Mariano and I sat on my living room floor, on that Sunday night in February and watched as Ed Sullivan introduced our adversaries. Carl and I laughed at them, we thought they looked ridiculous. Carl yelled out “Look, the drummer looks like Igor”. I just shook my head and said “How can they come over here and f&%k up our music and culture? Who do they think they are?” We were American kids, we didn’t need these assholes. Inevitably, the music changed and our culture took a turn. Me, Carl, and all our “wise guy, hipster” friends grew to like their music. In 1968, while living in Miami at college. Carl and I were, again, sitting on the floor, listening to the Beatles. But this time we, along with our friends Joe, Victor, and a bunch of other guys and girls, were smoking pot, talking about our ways and means to change the world. We sat there, sometimes for days, playing Sgt. Pepper’s over and over and over again, until we wore it out, breaking apart every lyric to every song and trying to come up with the real philosophical meaning of each one. Wow, Groovy, Far Out…… whatever, lol. People say that the Beatles came at a time when we needed something in respect to music, but I don’t agree. Yes, Elvis wasn’t popular as he was, and the doo-wop sound, at that time was dying, but we kids, from the valley, had no problem enjoying what we were listening to and dancing and singing our hearts out. The Beatles added something new and that eventually became ok with us. We accepted them, we liked them. I have a top ten list of my favorite songs of all time. Ranging from Nat King Cole, Frank Sinatra, Beach Boys, doo-wop etc, but you might be surprised to learn that “Here Comes the Sun” by George Harrison , (my favorite Beatle) is part of that top ten. Their music changed the world, and as much as me and my wise guy friends changed with it, we were always drawn back to our “roots”. Whenever we get together, to this very day, we assemble in a group of five or more and sing doo-wop, because if it weren’t for doo-wop and the sounds of all the 1950’s music, none of the forthcoming culture change would have happened.